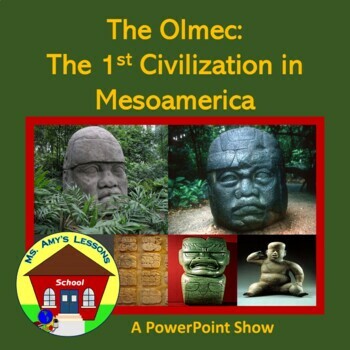 An in-depth examination of the three major civilizations of Mesoamerica: the Olmec, Maya, and Aztec civilizations from 1500 BC to 1521 AD covering Geography, Religion, Politics, Economics, and Social Structure. 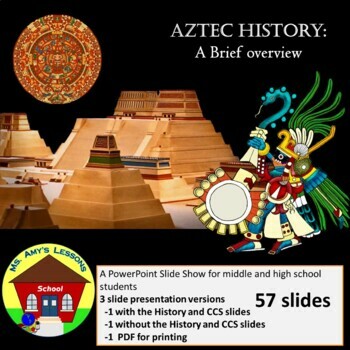 The presentation is geared towards middle and high school students. Successfully vetted by over 200 middle school students. 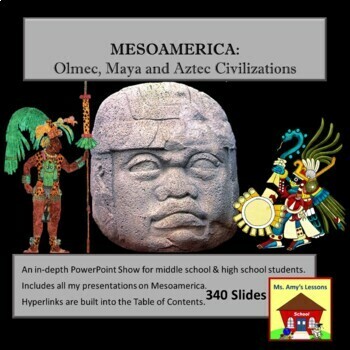 This is a fantastic presentation that actively engages students in questioning, reflection, dialog, and writing. Lesson presentation includes frequent opportunities for the students to discuss various topics and to parlay the eight writing opportunities either into a report or an essay. Hyperlinks have been included in the Table of Contents to make it easy to return to where you left off in the lecture the next day. I have included the notes I use for teaching this unit. If you click on the Presenter’s Screen, notes will appear on 193 of the slides. 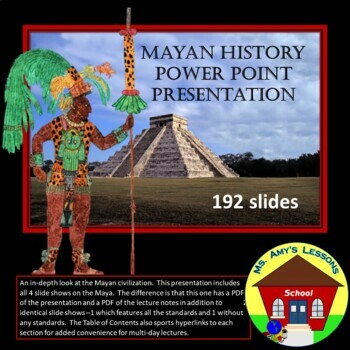 A sample excerpt from this presentation Ancient Maya Beauty Secrets is available as a free download. Slides are organized by color and icons for quick association.